But, look – there is also a grandstand or a pavilion with a smaller nearby structure in the picture, with spectators lined up at the edge of a race track. Questions … when was that structure built? It looks familiar; where else have we seen it in the course of our earlier research efforts? If my memory is correct, weren’t there photographs published in other anniversary publications of the Argus-Courier? Wasn’t there a Centennial edition for the City of Petaluma, as well as the Centennial of the newspaper? Were there any other articles about this pioneer aviator that we haven’t read yet? Yes, indeed, there were: the 85th Anniversary edition of the Argus-Courier, May 8, 1941, and the August 18, 1955 publication featured the Argus-Courier’s Centennial Anniversary. Both editions contained an article with illustrations related to the 4th District Agriculture Fair. Both articles contained detailed information (facts) about the formation and the evolution of the Fourth District Fair and its race track over the years. In the interest of reporting accurate information, here are excerpts from these 1941 articles: Uriah Edwards furnished grounds on the west side of town, on the Fair street that now runs through the Fair Grounds Addition, for the first Petaluma Fair in 1860. 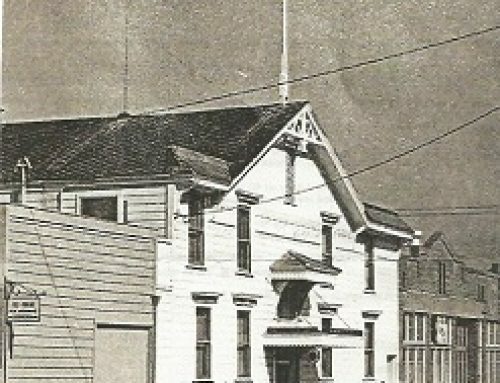 Ezekial Denman was elected president in 1870 when more land, adjacent to the old grounds was purchased and a race track, grandstand and the building now known as the Old Club House constructed….In the late 90’s Petaluma fairs lapsed. Kenilworth shared frequently in the record-breaking, the name “Fair Grounds Track” was gradually dropped and referred to as “Kenilworth Park,” the name it is known by today. Oh, oh … some significant information is missing that was mentioned in the 1955 article, and we also continued to search other newspapers. Stay tuned for Part III. Weren’t you told that this would be an “hysterical” journey?